Our mission is to provide top quality scenery construction, painting, scenery automation, and customer service to discerning customers in all areas of the entertainment and corporate industries. To provide the best possible products and services, and to have a good time doing it. We are committed to giving our customers a product or service that they see as good value for dollar while providing our employees with an environment that is respectful and sustainable. We strive to become the scenery supplier of choice to a wide range of customers in the entertainment and corporate industries. We hope the holiday season has been good to you so far. We've had a busy season, working on a new Broadway show and helping some major retailers prepare for their holiday rush. We partnered with KincInc on the portals for the Macy's State Street holiday windows, a much anticipated Chicago tradition that attracts huge crowds. We cut hundreds of giant snowflakes on our CNC router, and, on the automation front, customized a Q-Drive for a new show in Chicago. Check out some of the projects we've been working on below, and give us a call soon. We'd love to hear what you've been up to, and talk about any upcoming projects we could help you with. 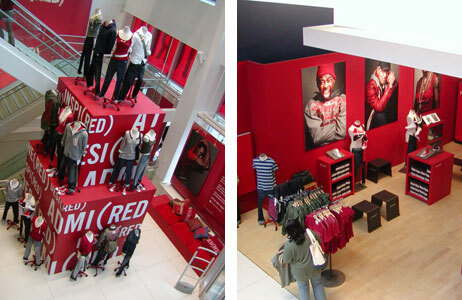 We partnered with the Gap’s interior designers to produce scenery for a product promotion on a tight schedule. The Gap was introducing their (Product) Red campaign, which is a line of clothing designed to help eliminate AIDS in Africa. The campaign was so high profile, it even included a televised visit by Oprah Winfrey and Bono. We needed to build a variety of items that had to function both as television props and as store fixtures for a month after the visit. Since store fixtures lead a rigorous life, and the turnaround was tight, the project offered some design challenges. But we live for challenges, and we spent a few evenings at the store with our client, trying out the scenery in different locations until everything was perfect for their big event. Our extensive experience in both television and retail interiors came through for the Gap on this project, and can come through for you as well if you've got a commercial interior project we can help you with. The production staff of the new world premiere musical Pirate Queen turned to us for assistance when they came to the Cadillac Palace Theatre to set up and rehearse for the first time. A new show is a rollicking, changing, evolving organism with many creative people collaborating and providing input. We assisted them with the many additions and changes that occured during the production process. Our project manager, Chris Wilson, stayed in constant communication with the Pirate Queen staff, and we wore a path in the floor of the theatre hallways with our comings and goings. Our tasks ranged from providing raw supplies such as steel and lumber on a moment’s notice all the way up to providing scenic units that got added along the way, such as the piers along the front of the stage. This show was a huge endeavor, and space to work at the theatre was non-existent. We made their lives easier by taking those projects from a verbal description and sketch to a finished, painted, delivered product in a very short amount of time. We're good at this kind of work, and we can do this for your production as well. 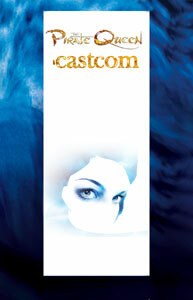 Be sure to give us a call if you are bringing a show to Chicago for production work. We'd be happy to help you. 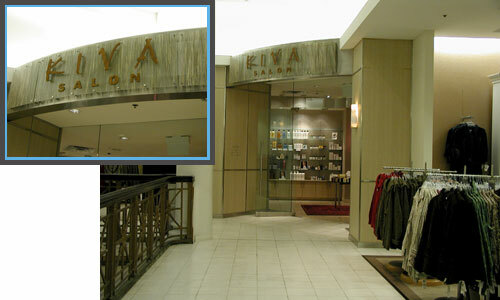 We recently fabricated a series of entry signs for Kiva hair salons located inside Macys stores. Kinc Inc, a highly creative upscale design company, turned to us to produce the cutout metal signs that simply shout “high end hair salon”. We were able to have the letters lasercut and then engineer a very flexible standoff mounting system to work in the varied wall surfaces that would support these letters. With the addition of a special metal treatment that both textured and chemically aged the metal, the final look was stunning. We are experienced in many materials and treatments, and even better, we're willing to experiment with almost any material you can think of (ok, lead and asbestos make us cringe a little...) So next time you need anything in the way of interior decor items, give us a try. After all, solutions are our main product. We have a lot of experience with automation and motion, and we provided the equipment for four various axes of motion built into the set for Transference. Because we did not build the scenery itself, and both the machinery we built and the set were evolving at the same time, this offered some extra challenges because we had no real knowledge of the loads or even the desired speeds of movement, or how some of the equipment would mount. But, as we often say, we live for challenges. So we got our toys to meet up with their toys in the theatre in a hurry. When we were done furiously working, we looked up and saw a thing of beauty. We've been in this business long enough to anticipate that theatre schedules can veer wildly off course, and we were still able to pull off this engineering feat smoothly and on time. Life in the theatre is not for the faint of heart!